Helsingfors , a city of Russia, capital of the grand duchy of Finland, on the gulf of Finland, 180 m. W. by N. of St. Petersburg; pop. in 1870, 32,113. It was founded by Gus-tavus I. of Sweden in the middle of the 16th century, burned by the Russians in 1728, taken by them in 1742 and again in 1808, and finally ceded to them with the whole of Finland in 1809. 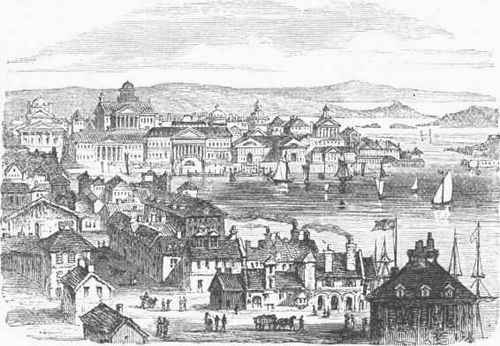 The government was transferred from Abo to Helsingfors in 1819, and a few years later the town was almost rebuilt. The streets were laid out with great regularity, public buildings were erected, and it has risen to be a large and handsome city. It has a fine harbor, capable of containing 60 or 70 men-of-war, protected by the fortress of Sveaborg, built on seven islands, presenting a front of about a mile, and mounting about 800 cannon. In 1827, Abo having been burned, the emperor Nicholas reestablished its university at Helsingfors. It is now called the Alexander university, and has four faculties, more than 50 professors, and about 500 students. In the senate house is a large and valuable library. The town contains a military academy with about 140 students, a Finnish society of art and one of science, fine museums of mineralogy and zoology, botanical gardens, an observatory, and several journals. There are manufactories of linen, sail cloth, and tobacco. The exports are fish, iron, timber, and grain. The trade in grain and in naval stores is active during summer.